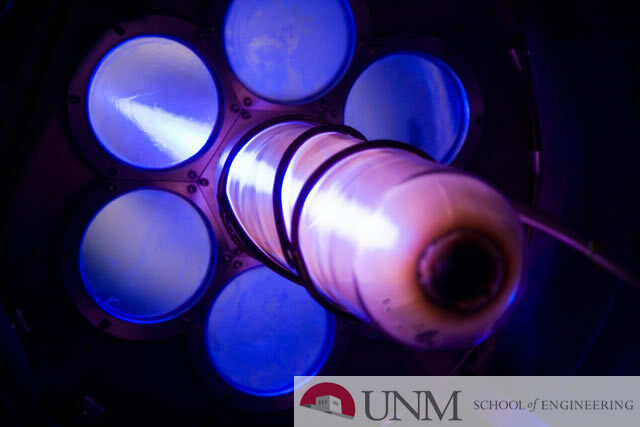 A compact A6 relativistic magnetron with diffraction output using a transparent cathode, simple mode-converter, and a permanent magnet were simulated and tested at the University of New Mexico (UNM) for the Office of Naval Research. The standard compact MDO with a simple mode converter and transparent cathode radiates a TE11 mode axially through a cylindrical horn antenna. The magnetic field, essential for magnetron operation, is provided by a Neodymium Iron Boron (NeFeB) GradeN40M rare earth magnet. The permanent magnet eliminates the need for a pulsed magnet and accompanying circuit, significantly reducing the size of the system. A permanent magnetic field is also ideal for repetitive rate firing, which was demonstrated at the Naval Surface Warfare Center Dahlgren Division (NSWCDD) High Voltage Advanced Research (HIVAR) Laboratory in Dahlgren, Virginia. An extensive sweep of input parameters was simulated using MAGIC, a three dimensional particle-in-cell virtual prototyping tool to find the ideal operational parameters to be experimentally verified. A sweep of input voltages was completed experimentally using UNM’s PULSERAD accelerator in order to compare and verify simulation results. The compact MDO with permanent magnet and transparent cathode were shipped to and assembled at the NSWCDD HIVAR Laboratory on their modulator and recommended input parameters from UNM’s simulations and experimental verification were demonstrated. Results from the experimental set up reproduced the qualitative behavior of the simulations and the simulated operating frequency of 2.5GHz was measured experimentally. The anticipated Gaussian radiation pattern from the 5 radiated TE11 mode was also experimentally verified by two ways, first by neon bulb grid array, and secondly by measuring the peak of the radiated microwave pulse relative to varying locations.